The film entitled The Big Blue is about the challenges and rivalry between two good friends who are talented and well known divers. The film starts when Mayol and Enzo are kids growing up together. One day they go to the sea shore and challenge each other to pick up a coin on the sea floor. Enzo succeeds and wins the challenge while Mayol loses. One horrible day the two children watch helplessly as Mayol’s father dies in a reef. He dived in the reef but unfortunately his breathing aid gets destroyed by the rocks causing his death. Some years later when the two kids are all grownups, Enzo saves a diver from dying after a shipwreck. An insurance broker called Johana Baker comes to Peru and is introduced to Mayol by Dr. Laurence. Later, Enzo tells Mayol about the World Diving competition in Sicily and encourages him to also register. When Johana finds out about it, she convinces her boss with lies about the situation in Sicily and this forces her boss to send her over to work there. She happily goes over there to meet Mayol and the two start dating. During the competitions, Enzo faces Mayol during the first rounds and Mayol wins. Enzo is happy for his friend and offers him a beautiful gift. When Johana returns to New York she gets fired from her job. She then returns to Sicily to continue spending time with Mayol as the diving competitions continue. As the competition continues, Enzo succeeds to set a new world record. Mayol comes back into the competition and beats Enzo’s record. Enzo becomes challenged by this and swears he will do anything to beat Mayol’s record again though Dr Lawrence warned that it is risky to dive beyond that depth. At the end, Enzo beats Mayols record in a risky dive and Johanan finds out she is pregnant for mayol. 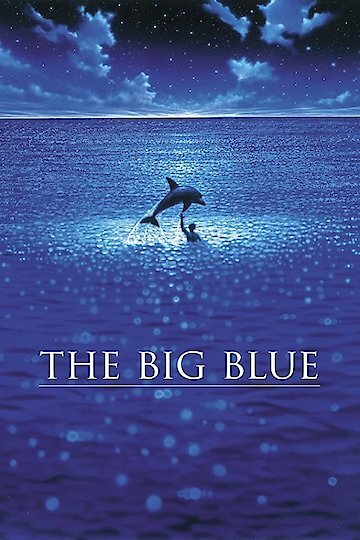 The Big Blue is currently available to watch and stream, buy on demand at Amazon, FandangoNow, iTunes, YouTube VOD online.